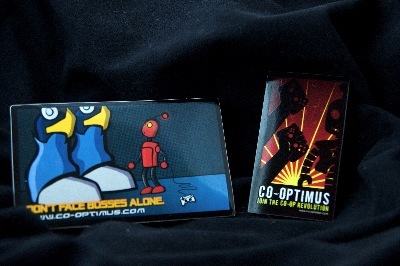 We're proud to announce that we have brand new official Co-Optimus Stickers for sale in our Store. These high quality printed stickers are perfect for sticking on just about anything - your laptop, backpack, desk, door, cat, dog, grandma, anything! There's two different stickers available; "Don't Face Bosses Alone" which was our first design, and this year's brand new "Co-Op Revolution" sticker. Each are available individually, but you can get both stickers for only $5. And in the true spirit of co-op we're going to send you two of each, one for you and one for a friend. That's four stickers for five dollars with free shipping. Act now, supplies are limited! Co-Optimus T-Shirts on Sale Now, Get Em Before They Are Gone! Page created in 0.6635 seconds.